Like Robin or Spock or Chewbacca, MCR's line of Sidekick gloves will back you up when the work gets tough. The heavy-duty cow side leather is sewn with high-grade Kevlar® thread that resists heat, abrasion, and cuts. Select Shoulder Leather Palm Glove features a 2 1/2" rubberized safety cuff and a GUNN pattern design. 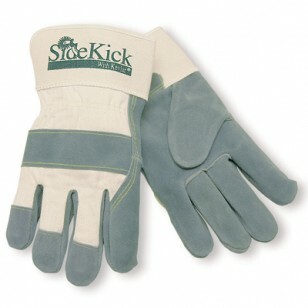 Gloves are abrasion resistant and durable. Ideal for landscaping, construction, farming, iron and steel work, assembly, and any general purpose application requiring leather protection.